Samsung has announced their another breath taking device Samsung Galaxy Camera during the launch of Samsung Note II Phablet. 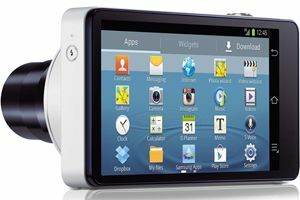 Samsung Galaxy Camera will hit the Indian market very soon on the occasion of Diwali that means in November 2012. Since we know that Samsung Galaxy series is rulled by breath taking Android devices and here is again the Android based Camera will be in market by Samsung in near future. There are several unique features in the Samsung Galaxy Camera as mentioned by Samsung during the launch of Samsung Note II Phablet. Some of the features of the Galaxy Camera include Slow Motion Video, Action Freeze, Share Shot, Auto Face Calibration, 65 on-screen editing featureslike rotate, crop, delete, etc., auto cloud backup and GPS with Glonass, etc. Now you can capture great images & videos via Samsung Galaxy Camera on this Diwali. Battery 2250 mAH Will come up with good battery backup. Google, Broadcom Corporation, HTC, Intel, LG, Marvell Technology Group, Motorola, NVidia, Qualcomm, Samsung Electronics, Sprint Nextel, T-Mobile and Texas Instruments were founders of OHA. OHA is a Consortium of Total 84 Companies.